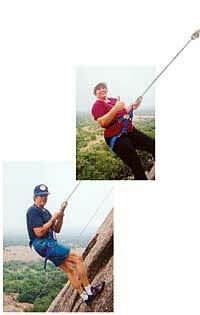 Rock climbing and turning 60! Turning 60! That used to be my mother?s age! Until recently, when I thought in terms of ?senior citizen,? I used to think of my mother. But, here it is, and I am now the beneficiary of those special ?senior discounts,? plus a membership with the AARP! What a shock it is to find myself in this category! When my husband, Gene, asked me what I wanted to do for my special, milestone birthday, I told him that I wanted to do something extraordinary?so, I picked repelling! I received numerous shocked responses from friends when I shared my birthday plans. ?Are you nuts?? they exclaimed. The mildest response was: ?It?s too hot, wait until autumn!? We met our guide at the State Park, who went over all of the safety measures until he was assured that we totally understood. We learned how to get into the harness, how to tie the ropes into special figure eight knots that wouldn?t come untied, which I thought was very important! We learned a new language unique to climbers, and that the climber and the person working the ropes need to communicate before any action takes place?an important rule in any situation! We learned how to work the ropes so that the climber would always be safe! When one partner was climbing, the other partner would be on the ground pulling one rope tight and at the same time pulling the other rope back on itself, to make sure the climber didn?t fall in case they slipped, which actually happened to me as I was repelling down the mountain! My feet became too close together and I lost my balance and went rolling across the mountain. Fortunately my wonderful partner, Gene, did everything right and I recovered my balance and continued safely down the mountainside. Because it had been so very hot in Texas (heat of 112? F/ 45? C) the rest of the class never showed up and we got private lessons! It turned out to be very overcast that day and the temperature never got out of the 80s! So God shined on us instead of the sun! It was a perfect day! We did several climbs with each climb being more difficult than the previous one. Our guide was exceptional and had a heart for teaching. He was about the age of our kids, very patient, and called us ?Mom and Dad.? We loved it! It was the most awesome experience for a sense of accomplishment that I have ever known. We held on to tiny little parts of rock and took advantage of cracks in the mountain. All in all, we did things we didn?t think were humanly possible! We learned to hold on with our fingertips, climb with our toes, push up with our palms and figure out which direction to take in order to reach our climbing goal, which looked totally impossible! Why did we decide to climb a mountain? Because we can! Will we do it again? Absolutely! When Pat and Gene Blasingame are not experiencing great rewards climbing a nearby mountain, they are Royal Emerald Directors from Houston, Texas, and are regularly scheduled facilitators for AIM Teleclasses?. They invite you to join them on their next AIM Teleclass? where they promise to tackle a more, ?down-to-earth? topic!